I recently had a chance to read the book “More Money for Beer and Textbooks” which is a book written for students in post-secondary education or in their last year of high school or CEGEP. It was written by Kyle Prevost and Justin Bouchard who are both educators and managed to get through their own schooling without any debt. They blog at MyUniversityMoney.com and YoungAndThrifty.ca. This book is excellent. It provides all the information that a student or about-to-be student needs to know about how to manage money while at school. It is written in an engaging and realistic style that should appeal to students. It’s doubtful as to how many young people will buy this book on their own, so I would urge anyone who knows a young person who would benefit from this book to buy it for them. Let’s face it – an 18 year old isn’t going spend $20 on a book, but if you or someone close to them buys it and gets the kid to read it, the returns could be huge. I’m going to start with the best chapter in the book which is chapter 15 (although it should have been chapter 1). This chapter deals with the topic of choosing an in-demand career. So many people sign up for a field of study which isn’t likely to turn into a decent career and they put themselves into a big financial hole. Your choice of career will outweigh any financial decisions you make while at school. Kyle & Justin do a great job with this sensitive topic by pointing out that degrees that have good employment prospects are not necessarily “better” degrees, but that they tend to lead to better careers and better finances after graduation. If you know someone who wants to do a degree which will lead to a promising Starbucks barista career – get them to read this chapter. I love the cover. Mmmm…beer. The book starts off with a very sobering and even depressing look at education costs and how much more they are than when old people like myself went to school. Well worth it for parents to read if they aren’t aware of the ‘new math’ when it comes to paying for post-secondary education costs. Great comparison of on and off campus housing. Don’t assume on-campus housing is always more expensive. Very valuable information and strategies about scholarships/grants etc. Good strategies about how to find a summer job. The authors also give their opinion on working during the school year. For another good money book for students who are nearing the end of their academic careers or have recently graduated – check out Rob Carrick’s How not to move back in with your parents. 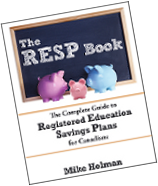 For parents of kids who are a bit younger, The RESP Book written by yours truly is a good resource for saving for post-secondary education using RESPs. As someone who didn’t grow up in Canada, discovering what educational options and expectations there are for my kids has involved a steep learning curve! This book sounds like a good primer for the next step – figuring out how our eldest son can best finance third level education. Would be delighted to win a copy ($20 saved towards his fees!). As a student myself, yes I could use it. Wow this book would be great for my daughter she has a Med interview on Mar 17th. Sounds like the perfect book for a couple people I know. Thanks for the contest and the great review. I hope to win the book. Since my kids were very young I have being trying to teach them be financially smart. I have a daughter graduated from college debt free. But I am having a hard time to convince my 10th grade son that he can do so as well. This book will definitely provide more information and resources for my boy. Thank you for posting this message. I have 3 grandchildren, and 2 will be starting high school this year. I will be helping them with their education, but would require them to contribute through summer jobs and to choose degrees with thought to future earning power. I would love for them to have this book and read it so I could discuss their options with them. I would love to have copy of this book to not only update and educate myself (as my oldest completed university 10yrs ago) but also give to read to my bookworm daughter who is a teenager to have better understanding of what is involved to continue further education ie thoughtful planning! Sounds like great book! I know several people that would benefit from reading this book. Would love to win a copy! Great review, Mike! I know a couple of first year students who could use this book…. Perhaps more importantly, their younger brothers (who I forsee wanting beer money) could benefit from the hand-me-down. I’m happy to buy copies for them, though — lots of other folks here are closer to their intended recipients. Thanks for the tip, Mike! I have a son in second year university and my daughter is now in grade twelve deciding what she wants to do. This book would help me, and them, with our financial decisions. Thanks for the opportunity. My daughter is hoping to get into BCIT and while we have saved some money in a RESP it will not be enough. We are working to determine what her monthly budget should be but it is difficult so your book would be extremely helpful. She has some expectations that we feel are a bit unrealistic and a third party view would really help. She is just finishing grade 11 and we live in Nanaimo. This book appears to have the same message as my kids are giving me – I’m not investing in a post-secondary education unless I know it will pay off. Thus neither is in post-secondary (at the moment). I’m from the generation where going to post-secondary is just what you did – or you went and worked on the rigs, made a ton of money and laughed at those in Arts, Education or Phys Ed. Sounds like I could benefit from reading the book! Mike…love the concept of the book but don’t agree that student loans are a bad thing in all cases. I have proof. Two of my children, now graduated, took out student loans every semester they were eligible. The money then went directly to a savings account, not to be touched and paid back when due. Each year, they would receive a letter from the Millenium Scholarship fund “forgiving” part of their student loan. Over the years they were eligible for loans this amounted to some $10,000 plus. I know the fund was phased out a couple of years ago but believe there still is a mechanism in place to “forgive” some amount of student loans. Daughter heading into high school…where her course choices affect university programs…never too early to start thinking. Also getting set on first jobs, where she’ll be learning money habits…never too early to start saving. This book would be a fabulous reality check. Hope to win this book! Daughter in university and needs help! Thanks for another great post. I am always eager to learn more about personal finances and we discuss about it with our children. I have the RESP book and both of my kids are always enthusiastic to talk about the money being acrued in their RESP accounts. My daughter is in high school now. I see the great benefit of this new book for her. Would love to win this book, could put it to good use!! I’d love to give this book to a member of my extended family who is just starting out on the post-secondary education rollercoaster. She’s followed a hard road so far; left home at 16, fell in with the wrong crowd, didn’t finish high school, and has become a new mother… at 23 she’s finishing her first year in an engineering-related college program and is applying to transfer to University as we speak. She has no financial help from family and has figured out the OSAP and scholarships process; that said, she would still really benefit from this guide. I’d love to give her this book to help her run the post-secondary gauntlet without getting too beaten up financially (but I’ll get it for her anyway, even if I don’t get it here). My son doesn’t understand the difference between fantasy and reality so maybe this book would make him realize what he’s in for. He would definitely benefit one way or another from reading it. Thanks. Very practical post- enjoyable as always. I would love to win a copy. My nephew is turning 18 on Wednesday and this would be the perfect gift. Before I read about the giveaway I started calling bookstores but noone has a copy in stock. Do you have any idea where I could purchase a copy prior to Wednesday in Edmonton? Thanks for the post! I’m blown away by the great review and the positive responses here Mike. My favourite chapter is actually the final one that you highlighted as well. It has generated some debate amongst my teaching staff that all has B.A. degrees, but the math doesn’t lie as far as Canada’s labour market is concerned! Thank you to everyone who shares this review with their friends and family. As a teacher that is familiar with all of the literature in this field I can guarantee there is nothing else like it. Thanks again for the kind words Mike, and all of your help with the project! I have a nephew starting at Mac in the fall, might be good for him to read this? This book sounds great – I’ve got two kids who will be heading to university in the near future so this book would be useful! Sorry for the distribution problems. We’re learning how complex and slow-moving the book world is compared to the blog world. Amazon is having a hard time keeping our book stocked right now, but if you want to order online you can try Chapters/Indigo. Your best option is likely to call the McNally Robinson in Saskatoon where we are definitely in stock (not sure what their mail-order policies are). McNally has been stocking and selling the book at a brisk pace, but Chapters/Indigo is a tough nut to crack. They can order it in for you, but convincing them to stock the product is proving tough. We promise to keep trying to make our way in a distribution world controlled by a very select few established parties. Once again, a big thanks to Mike for allowing us to share the book with his audience! Previous post: When Did The TFSA Start?